Digestion is the breaking down of large food particles into smaller ones while absorption is the movement of these smaller particles from the lumen of the digestive tract into the blood. Digestion begins in the mouth and is completed in the small intestine. Most absorption occurs in the small intestine while the primary function of the large intestine is the absorption of water. The large S-shaped structure represents a longitudinal view of the mouth through the beginning of the small intestine. The mouth begins at the upper left corner of the model. The first curve, where the structure is wider, is the stomach. The second curve and the remainder of the structure is the small intestine. The brown structure is the liver with its gallbladder (green) and the pink structure is the pancreas. The ducts from the liver and pancrease fuse before entering the small intestine. The donut where this duct enters the small intestine is the sphincter of Oddi. Above the liver and within the curve of the stomach are two squares representing central nervous system, CNS. 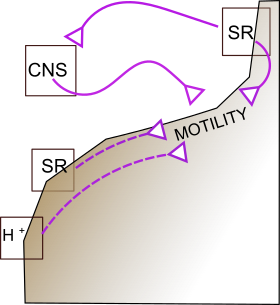 The purple lines with triangles at their ends represent stimulatory (solid line) nerves leading to glands and smooth muscle ('motility') of the stomach. Nerves also arise from stretch receptors (SR) in the wall of the stomach and small intestine that stimulate (solid line) and inhibit (dashed line) gastric motility. Exocrine glands ( small circles) secrete their products (blue arrows) into ducts that lead to hollow organs. The circle near the mouth represents salivary glands (SC) that secrete amylase into the mouth. The circle just below the liver represents Brunner's glands (BG) that secrete mucus into the small intestine. Cells lining the ducts within the liver and pancreas are glandular and secrete sodium bicarbonate. The pancreas produces pancreatic juice that enters the small intestine. This 'juice' consists of procarboxypeptidase , chymotrypsinogen, trypsinogen and amylase . Tubular gastric pits line the wall of the stomach and contain several types of cells. Abundant the upper regions of the stomach are chief cells, C that secrete pepsinogen and parietal cells, P that secrete hydrochloric acid, H+. Endocrine glands (small hexagons) secrete hormones into the interstitial fluid; these hormones are usually picked up by the bloodstream but may diffuse directly to, and affect, nearby tissues before entering the bloodstream. Arrows leading from them point to their respective targets. A solid green arrow means the target is stimulated and a dashed red arrow means the target is inhibited. Two hormones are produced by glands in the wall of the stomach; histamine (H) and gastrin (G). Two hormones are produced by glands in the wall of the small intestine; secretin (S) and cholecystokinin (CCK). Follow each arrow leading from the endocrine glands to see which targets are stimulated and which are inhibited. There are stretch receptors (SR) in the stomach and intestinal walls that are part of a unique nervous system. Stimulatory (solid line) and inhibitory (dashed line) nerves originate in these receptors to affect the motility of the stomach. There are also acid receptors, H+ in the wall of the small intestine that inhibit stomach motility. Digestive chemical reactions are indicated inside specific regions of the GI tract. The enzymes involved are shown in red italics. Black arrows lead from reactants to products. Some enzymes are bound to cell membranes lining the intestinal wall. Below the intestine are the final absorbed products of digestion. The gastrointestinal tract has a self-contained, 'enteric', nervous system within its walls. The central nervous system (CNS) also plays a role in the tract's motility as indicated by purple lines originating in the CNS box. The inset depicts the role of this system in the motility of the stomach. Nerves() purple lines) embedded in the stomach wall (drawn along the inner stomach wall) relay impulses from stretch receptors (SR) in the stomach wall (top small square) . These impulses stimulate (solid purple line) the motility of the stomach when food is present. These same receptors simultaneously send stimulatory signals (solid purple line) to the central nervous system (CNS square) that returns stimulatory (solid purple) signals to the muscles of the stomach wall to reinforce motility. When food leaves the stomach , stretch receptors in the small intestine (lower small square) send inhibitory signals (dashed purple lines) back up to the stomach muscles. This decreases gastric motility until food moves further down the small intestine. Hydrogen ion receptors (H+) operate by the same mechanism and have the same effect on gastric motility. This interplay between the small intestine and the stomach is referred to as the 'intestinal phase' of gastric activity. This inset depicts the role of the central nervous system (CNS square) in initiating the secretion of 'gastric juice'. This is referred to as the 'cephalic phase' of gastric activity. Stimulatory nerves (solid purple lines) innervate chief (C) cells and parietal cells (P) that line the gastric pits in the upper regions of the stomach. 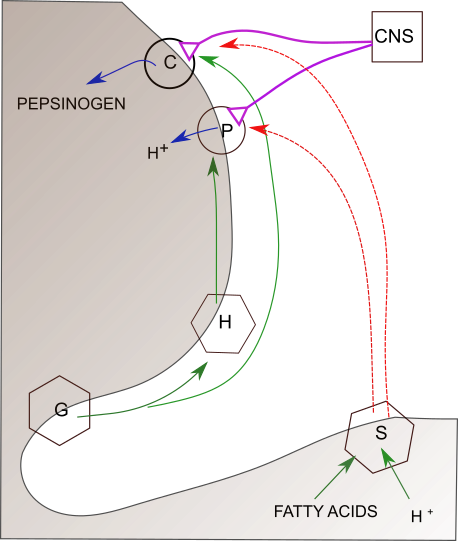 The blue arrows indicate that pepsinogen is secreted by the chief cells and hydrochloric acid (H+) is secreted from the parietal cells. Hormones are secreted into the blood; this is represented in the map by drawing arrows outside the symbolic GI tract. Hormones play an important role regulating gastric motility. They also control the secretion of gastric and pancreatic juice plus other secretory activities. The hormone gastrin is produced by cells lining gastric pits in the lower region of the stomach (G hexagon). Gastrin stimulates (solid green arrow) stomach motility. Hormone secretion is caused by the presence of peptides, amino acids and caffeine in the stomach (solid green arrows). Gastrin secretion is inhibited (dashed red arrow) as stomach acidity (H+) increases. The intestinal hormone cholecystokinin is secreted into the bloodstream when peptides, fatty acids & monoglycerides are present in the small intestine. CCK inhibits (dashed red arrow) gastric motility. Chief cells (C) --also called zymogenic cells--secrete (blue arrow) pepsinogen into the stomach. Parietal cells (P) secrete hydrochloric acid here represented by the active component, hydrogen ions, H+. Blood-borne (solid green arrow outside the stomach wall ) gastrin (G) stimulates the chief cells while its affect on the parietal cells is mediated by histamine (H). Histamine is a 'local hormone' meaning that it's release into the tissue fluid directly affects nearby cells without having to be transported there in the bloodstream. Cells that release histamine into their surroundings (labeled hexagon) are found near parietal cells. Histamine affects parietal cells by making them more responsive to neural stimulation (solid green arrow) from the CNS. When food passes to the small intestine, fatty acids and hydrogen ions (H+) cause secretin to be released into the blood stream . This hormone inhibits (dashed red arrows) both the chief and parietal cells. The hormone secretin (S) (S hexagon)--the first hormone discovered, 1902-- is released into the bloodstream when fatty acids and hydrogen ions (H+) enter the small intestine. This hormone stimulates (solid green arrow) Brunner's glands (BG), in the first section of the small intestine, to secrete (blue arrow) mucus into the intestinal tract. This mucus coats the intestinal walls to protect them from the increasing acidity. Secretin was named because it stimulates (solid green arrows) the duct cells in the pancreas and the liver to 'secrete' sodium bicarbonate. The bicarbonate ion reduces the acidity (dashed red arrow) in the small intestine by combining with hydrogen ions. CCK also stimulates (solid green arrow) the smooth muscle of the gallbladder to contract thus releasing bile into the small intestine. Carbohydrate reactions are indicated by black arrows. The enzymes involved are in red italics and label the relevant reaction arrows. Membrane-bound enzymes are written along the inner surface of the GI tract. Carbohydrates are composed of chains of simple sugars. The term polysaccharide refers to the largest molecules, oligosaccharides contain from 3 to 10 sugars, disaccharides are double sugars, and monosaccharides are simple sugars. 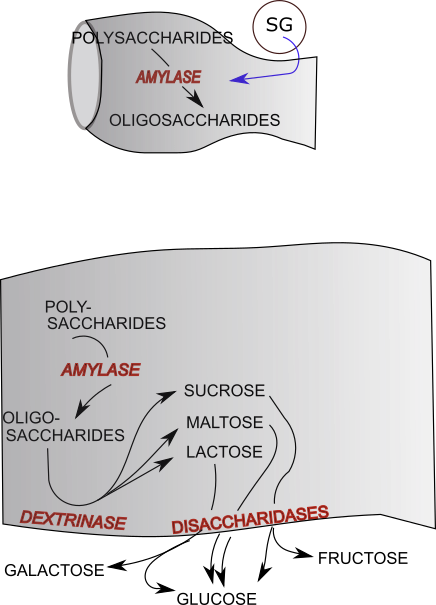 The top inset shows the mouth where amylase in saliva breaks some polysaccharides into oligosaccharides. These then continue, unaffected in the stomach, to the small intestine (bottom inset). 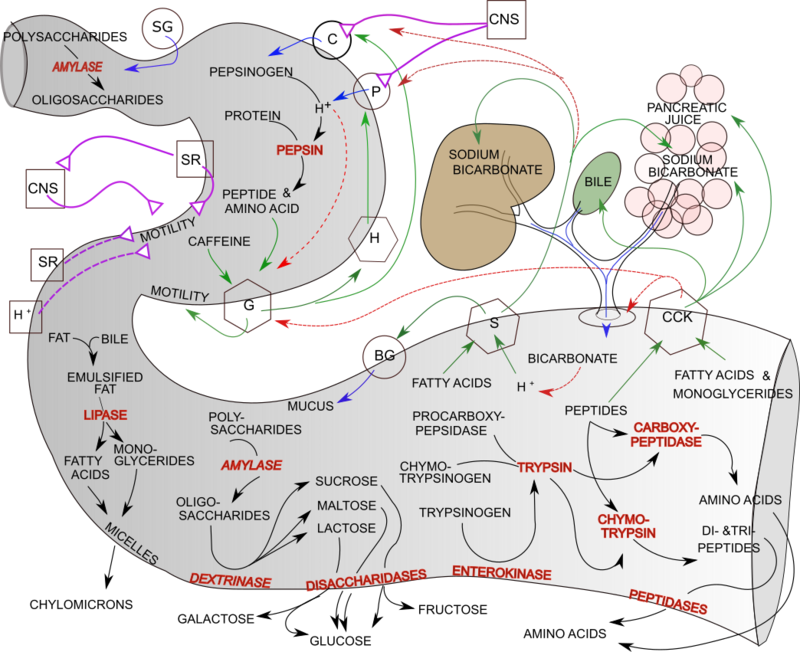 Polysaccharides that survived digestion in the mouth are broken down there to oligosaccharides by pancreatic amylase. The remaining enzymes ... enzyme names end in '-ase' ... involved in carbohydrate digestion are membrane bound. Dextrinase breaks oligosaccharides into the disaccharides sucrose, maltose, and lactose. 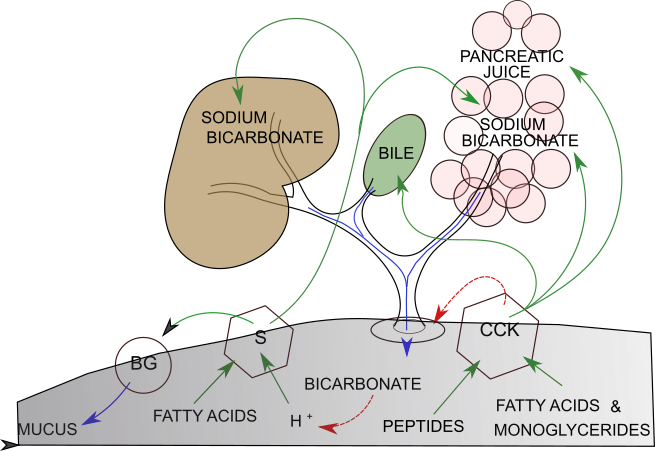 Next, disaccharidases (sucrase, bbmaltase, lactase, not shown) break the corresponding disaccharides into monosaccharides that are absorbed into the bloodstream. 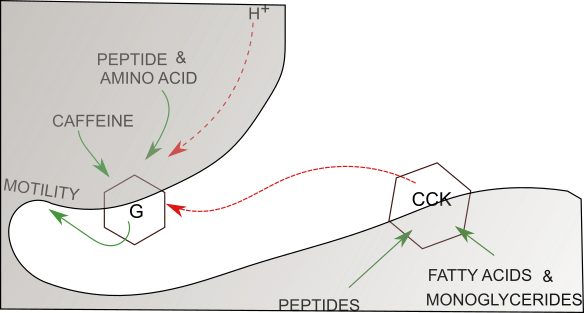 Black arrows point from each of these disaccharide to their corresponding monosaccharides. Sucrose yields a molecule of glucose and a molecule of fructose. Maltose yields two molecules of glucose. Lactose yields one glucose and one galactose. Protein digestion occurs in the stomach and the small intestine. Reaction arrows are black. The enzymes involved are in red italics and label the relevant reaction arrows. Pepsinogen, the inactive form of pepsin, is secreted ( blue arrow) by chief cells (C) that line the gastric pits. 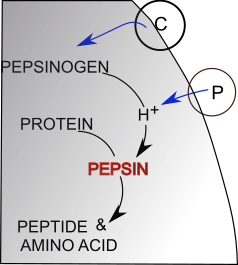 Pepsinogen is activated by hydrogen ions (H+). These ions are from the hydrochloric acid secreted (blue arrow) by parietal cells (P) that also line the gastric pits. Proteins are long chains of amino acids. The enzyme pepsin hydrolyzes proteins into fragments of various sizes called peptides; some amino acids are also produced in this manner. Hydrolysis of peptides from the stomach continues in the small intestine by the action of three 'proteases' that are components of pancreatic juice. These 'proteases' are inactive until they reach the lumen of the small intestine; they are procarboxypeptidase, chymotrypsinogen, and trypsinogen. Their activations are indicated by the black reaction arrows. The enzyme enterokinase is membrane-bound along the lining of this region of the small intestine. It converts itrypsinogen into its active form trypsin. Trypsin catalyzes the conversion of both procarboxypeptidase and chymotrypsinogen into their active forms, carboxypeptidase and chymotrypsin, respectively. These are represented by the black reaction arrows with 'trypsin' written atop them. The enzyme chymotrypsin, like pepsin, hydrolyzes peptides in various size smaller amino acid chains finally producing dipeptides & tripeptides. 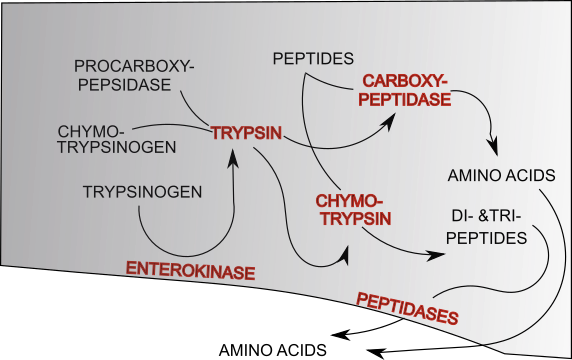 Carboxypeptidase specifically hydrolyzes the amino acid from the carboxyl end of peptide chains to yield individual amino acids . Amino acids are transported through the cells lining the small intestine and into the blood. The small peptides are transported into the cells lining the small intestine where intracellular peptidases convert them into amino acids that then enter the blood. Amino acids in the intestine are absorbed directly into the bloodstream. There are several types of lipids; only triglycerides (fats) are considered here. Triglycerides--and other lipids--are not water soluble and remain clustered together forming large globules. The individual triglyceride molecules will be broken down into a monogylceride and two fatty acids by the enzyme lipase that is a component of pancreatic juice. However, this enzyme is water soluble and can only affect triglyceride molecules at the surface of the lipid globules. Bile, produced in the liver and stored in the gallbladder, increases the total surface area of the lipid clusters by coating the many small lipid clusters formed by the mechanical movements of the GI tract. Fat that has been changed from large globules into many small clusters is called emulsified fat. The total surface area of these numerous small clusters is much greater than that of a few large globules and the enzyme lipase can now access its target. 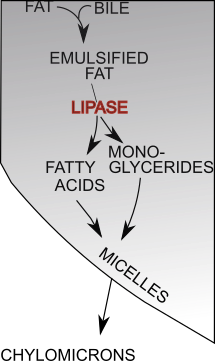 As lipase continues to hydrolyze triglycerides, small droplets of fatty acids and monoglycerides called micelles are formed. These diffuse into the cells lining the small intestine. Within these cells the fatty acids and monoglycerides are recombined into triglycerides (not shown here) and packaged as water-insoluble packets called chylomicrons that leave the cell by exocytosis to enter the lymphatic lacteals that eventually lead to the bloodstream.